Book Closure for issuance of Rights Shares of National Life Insurance Co. Ltd.
News Title Book Closure for issuance of Rights Shares of National Life Insurance Co. Ltd.
National Life Insurance Co. Ltd. has informed NEPSE on 2075-03-13 about Book Closure for issuance of Rights Shares. For more details, please visit our website and find the company's letter. Adjusted price for SMATA is Rs.1401.33 for 50% of Right Share. Its Average Base Price is Rs. 845.17. 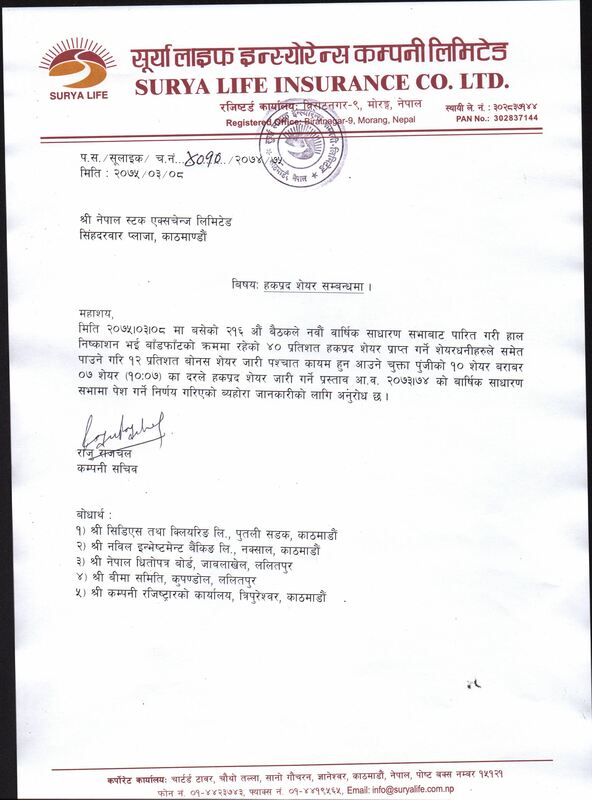 Book Closure for Rights Share of Nagbeli Laghubitta Bittiya Sanstha Ltd.
News Title Book Closure for Rights Share of Nagbeli Laghubitta Bittiya Sanstha Ltd.
Nagbeli Laghubitta Bittiya Sanstha Ltd. has informed Nepse on 2075-03-11 about Book Closure for Rights Share .For more details please find the company's letter. Information Regarding AGM and Book Close date of KAMANA SEWA BIKAS BANK LTD.
News Title Information Regarding AGM and Book Close date of KAMANA SEWA BIKAS BANK LTD. Please Find the attached Letter and Notice Regarding the information of our 11th AGM and Book close date. Appointment of Board members in Unnati Microfinance Bittiya Sanstha Ltd.
News Title Appointment of Board members in Unnati Microfinance Bittiya Sanstha Ltd.
Unnati Micorfinance Bittiya Sanstha Ltd. has informed NEPSE on 2075-03-10 about the appointment of Board member.For more details, please visit our website and find the company's letter. Rights share of Surya Life Insurance Company Limited. News Title Rights share of Surya Life Insurance Company Limited. Surya Life Insurance Company Limited has informed NEPSE on 2075-03-10 about Rights share .For more details, please visit our website and find the company's letter. Book Closure and AGM of Surya Life Insurance Company Ltd.
News Title Book Closure and AGM of Surya Life Insurance Company Ltd.
Book Closure of Sindhu Bikash Bank Ltd.
News Title Book Closure of Sindhu Bikash Bank Ltd.
NRB approval for Bonus Share of Sindhu Bikash Bank Ltd.
News Title NRB approval for Bonus Share of Sindhu Bikash Bank Ltd.
AGM of Sindhu Bikash Bank Ltd.
News Title AGM of Sindhu Bikash Bank Ltd.
Sindhu Bikash Bank Ltd. has informed NEPSE on 2075-03-10 about its AGM.For more details, please visit our website and find the company's letter. Adjusted price for BOKL is Rs.273.73 for 13.25% of Bonus Share. Its Average Base Price is Rs. 368.37. Nabil Bank Limited has informed NEPSE on 2075-03-08 about the appointment of new CEO.For detail information, please find company's letter attached in our website. 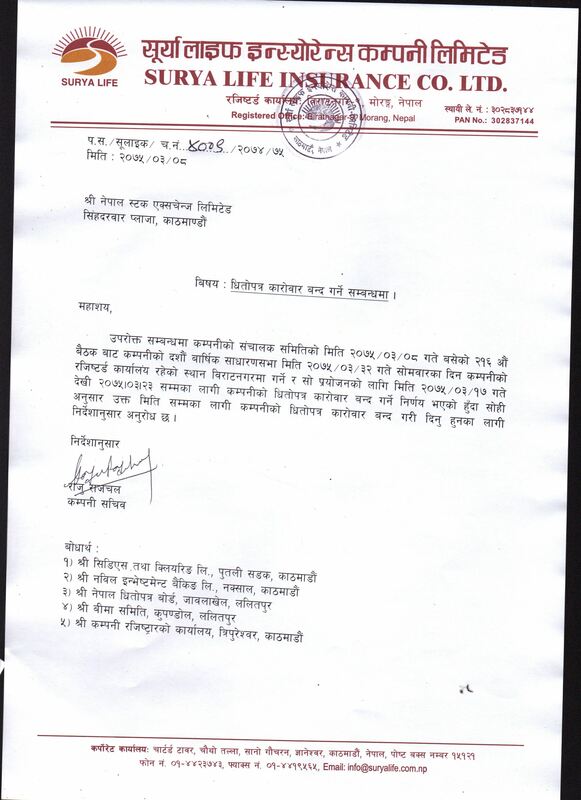 Kabeli Bikas Bank Limited has informed NEPSE on 2075-03-08 about the book closure and AGM date. For detail information please visit our website and find company's letter. The board meeting of company (2075.03.08, meeting no.216) had proposed 10:07 right share.